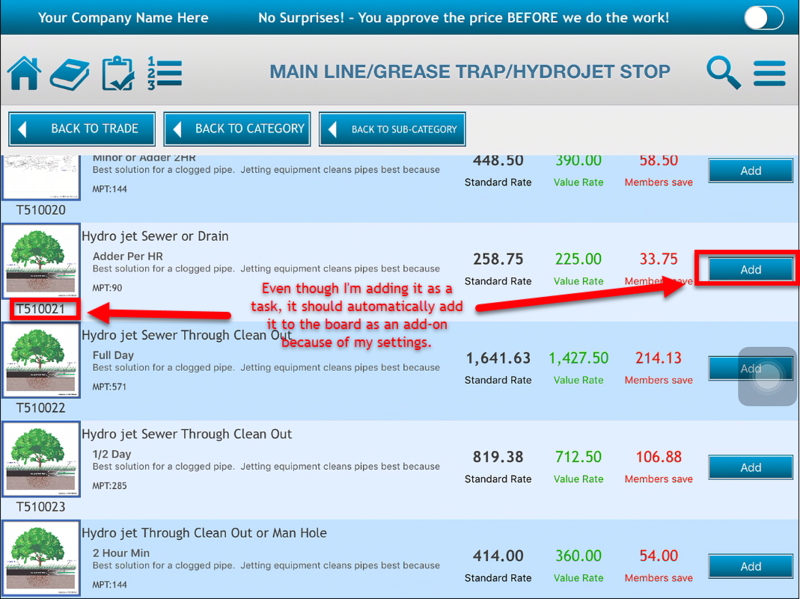 With our latest update to Profit Rhino, we've made a great effort to cut down on the hassle for your technicians. Mainly, when it comes to creating dynamic option boards. If you're not familiar with dynamic option boards, I would recommend you check out some of our other articles on the topic. But, to simplify it a little bit, dynamic option boards are the option boards your technicians create out in the field and then personally save to their accounts. There was only one problem though, when we pushed our update that allowed you to choose whether or not option boards used only tasks or automatically determined whether it should be a task or add-on by price, it did not apply to dynamic option boards. That meant that technicians were forced to toggle in between tasks and add-ons every time they created their dynamic option boards manually. That was pretty inconvenient, but it should no longer be a problem. As denoted in the text above, you can now choose from three options for your "Display Task/Addon". 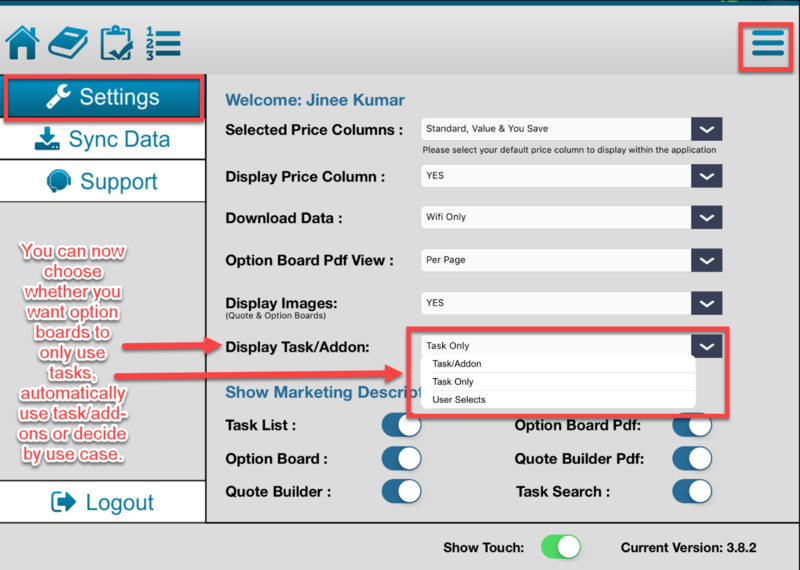 You can choose to have it automatically determine whether it's a task/addon by price (Task/Addon), have everything automatically be a task no matter what (task), or have the option to choose which each new task you add to an option board or quote (User Selects). To experience the new changes, set it to Task/Addon. Ta-da. Even though I added it as a task, it became an add-on. Now I'll no longer have to manually toggle every single time, unless I want to. All of these changes also apply when building a quote. So, if you add an expensive task, and then add a less expensive task to a quote, the latter will just become an addon instead. 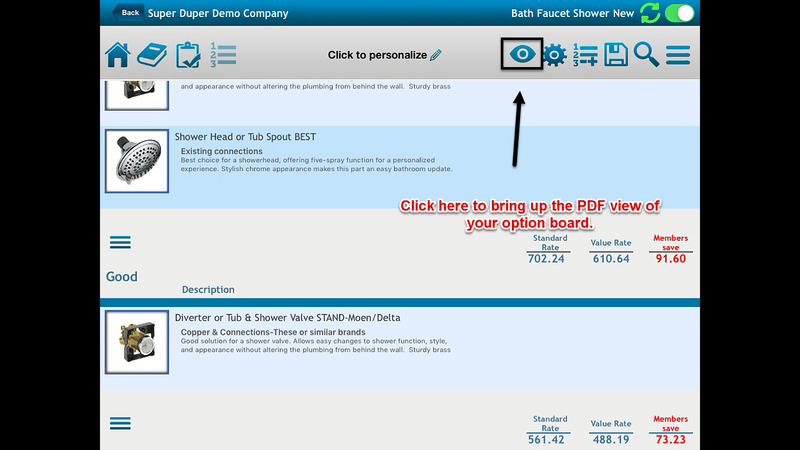 Additionally, when you go to present your option board in PDF view. You'll see a new banner showing how much a customer is saving by making all of these repairs listed in your option board at the same time instead of one by one over the course of a couple months. 1st. Log on to the web version of Profit Rhino. 2nd. Go to the [Settings] section. 3rd. Go to the [Mobile Settings] section. 4th. Scroll down and change Task/Addon Difference to "Show" instead of "Hide". Once you've changed your settings here, resync your pad so that it accounts for the update. 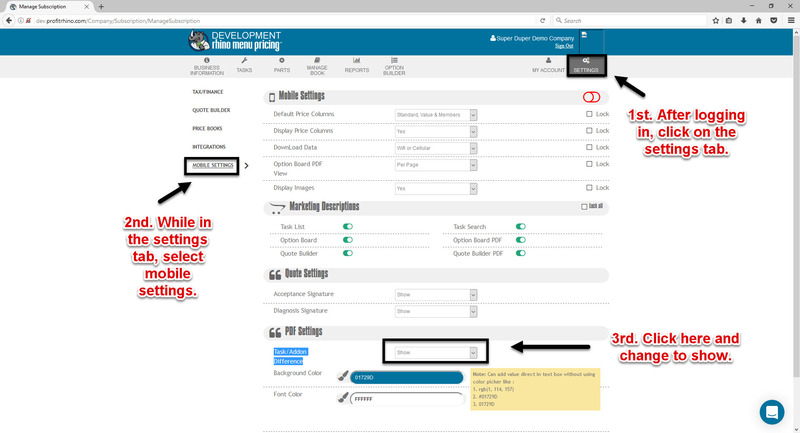 Then, head back into the option builder section. 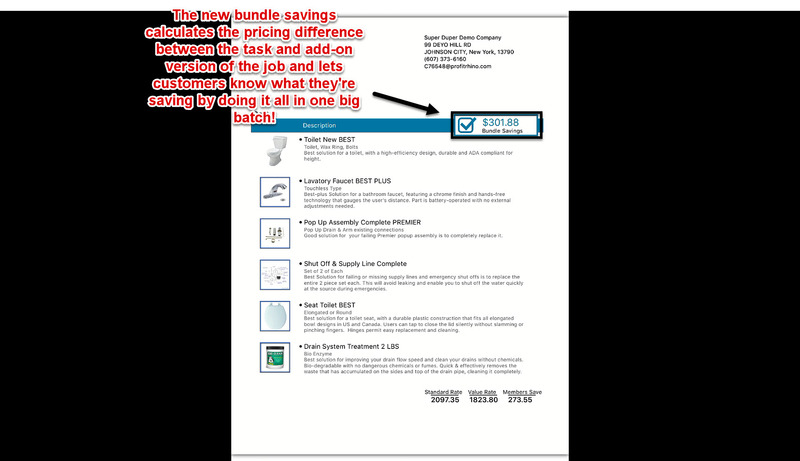 You'll see up there at the top of the PDF, there's a new banner labeled Bundled Savings. 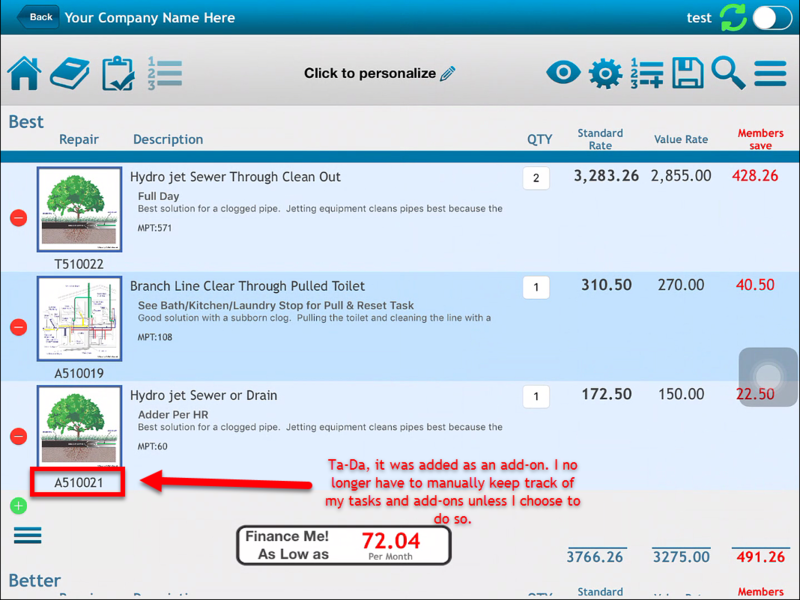 Essentially, since add-ons are less expensive than tasks, your customers will be saving money by doing all these repairs at once instead of doing it piecemeal. By showing them those savings up front in big letters, you're further convincing them the options you're offering them are the right choice. With these changes made to Profit Rhino, you should find your profits sky rocketing as customers see the value of picking the options you recommend.